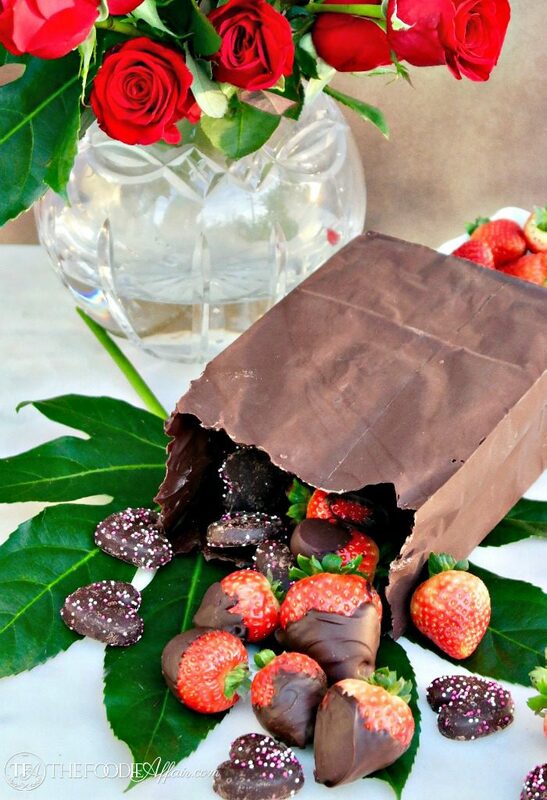 Chocolate bag dessert filled with your favorite treats! This do-it-yourself centerpiece is a stunner, and will be the star of any special occasion! This chocolate bag is edible! I love that you can see the folds and creases from the bag that it was molded from. Those little details that don’t usually notice sure add some fun character to this dessert center piece! The inspiration form this dessert idea was from a get together I attended 15+ years ago when Alan was active-duty and deployed to the Persian Gulf. If you aren’t familiar with the military life-style, a deployment is when a whole infrastructure, which in our case was a squadron leaves their home base and works out of another part of the country. It was exciting for Alan to be on a mission. He got to see so much of the world, and since he loved flying, work was pretty much a dream job. The tough part was the six month separation. I lost count of how many deployments our family endured during our active-duty years, but it was at least 6 or 7 times. Those years were full of challenges and amazing experiences. I could and probably should write a book! During deployment you really form a tribe quickly. With our husbands thousands of miles away and our families too, we relied on each other’s strength. Although it was tough at times, we also had a lot of fun! Keeping busy with fun activities and everyday living occupied our days, and since we were our family away from family we threw each other lots of celebrations. Birthdays, Christmas, Thanksgiving, Fourth of July and Valentine’s Day gatherings. Of course every celebration centered around good food and the presentation was always thought out and festive! If I remember correctly, this chocolate bag was displayed at a fundraising event. Can you believe that it stuck in my mind after all these years and I’m just making it for the first time?! 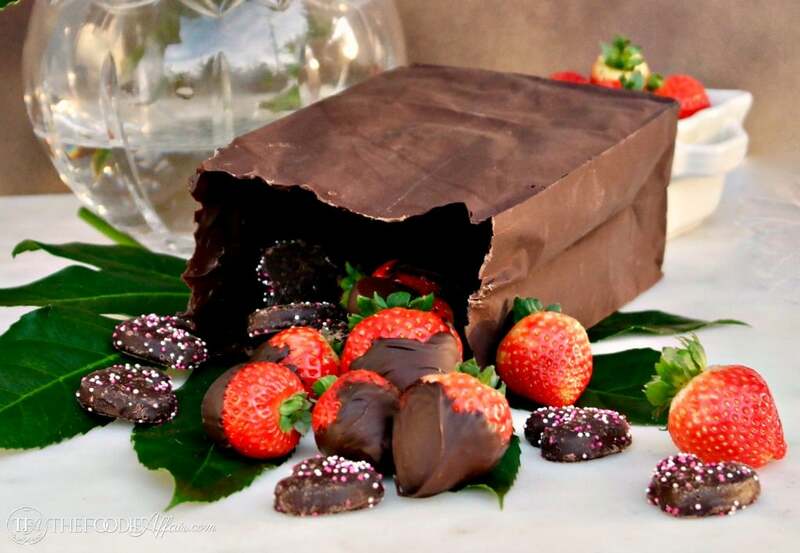 This chocolate bag dessert is one of most creative ways to display sweet treats. You’ll need a sturdy paper lunch bag (I used two since I had thin white ones), a pastry brush, and melted chocolate! Then the fun comes because it can be filled with a variety of treats! How about these Peanut Butter Snowballs or these Mini Baked Sweetheart Donuts! 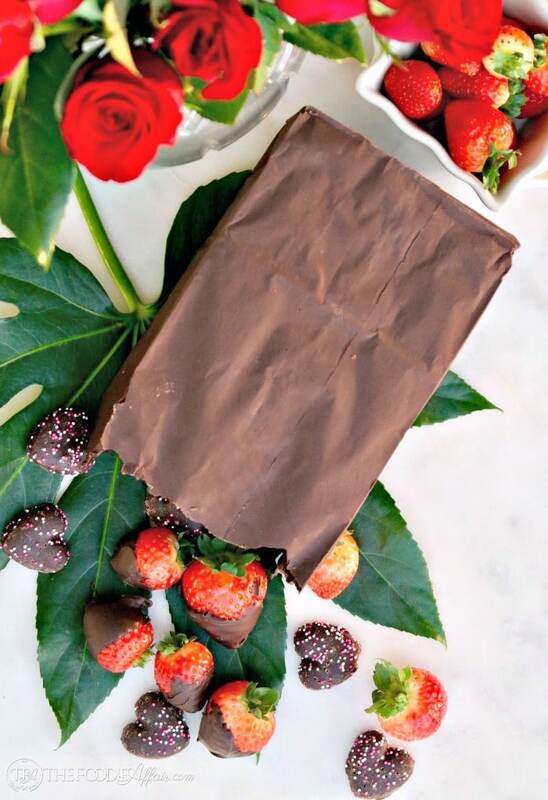 Dipped strawberries are always a hit! Open bag and fold down the top rim of the bag 1-inch. Set aside. 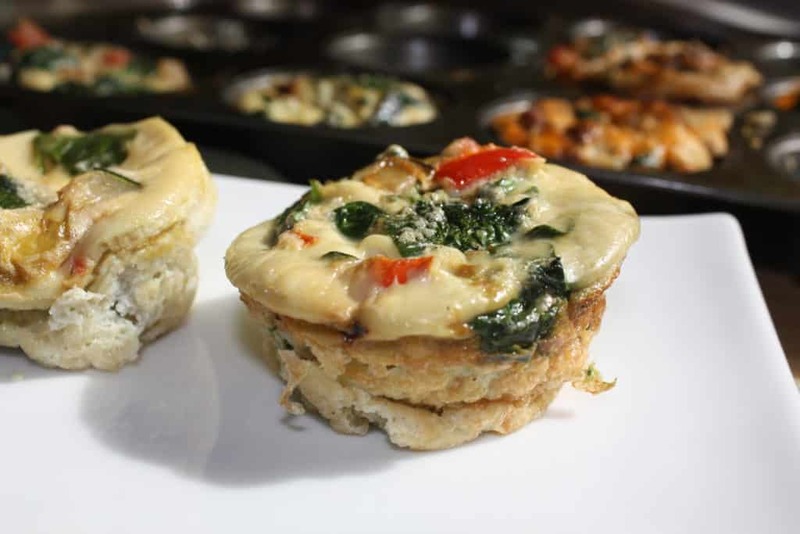 Melt have of the chocolate chips in a double broiler or microwave until creamy. Place bag on a sturdy baking sheet. 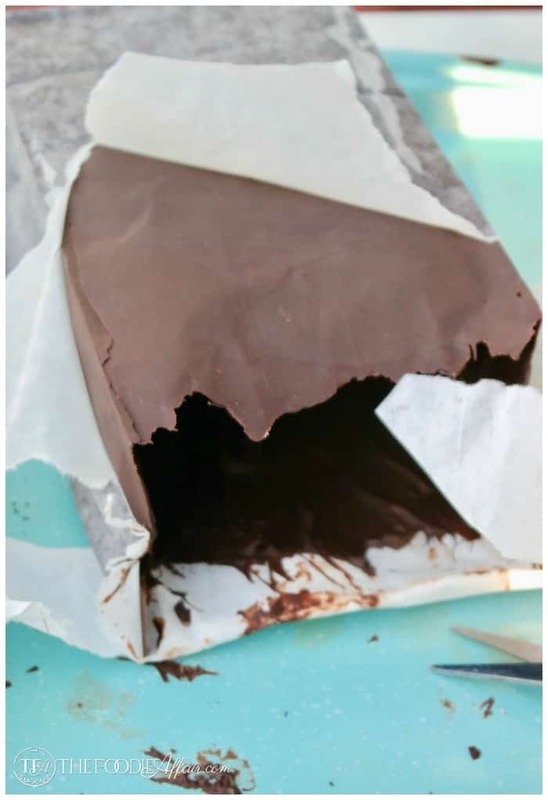 Spoon in some chocolate on one side of the bag and smooth to about 1/16-inch thickness with a pastry brush. Place in the refrigerator for 10 minutes while the chocolate hardens. Repeat until all sides are covered in chocolate. Gently place bag up right and coat the bottom of the bag with chocolate. Return to the refrigerator until firm for about an hour. 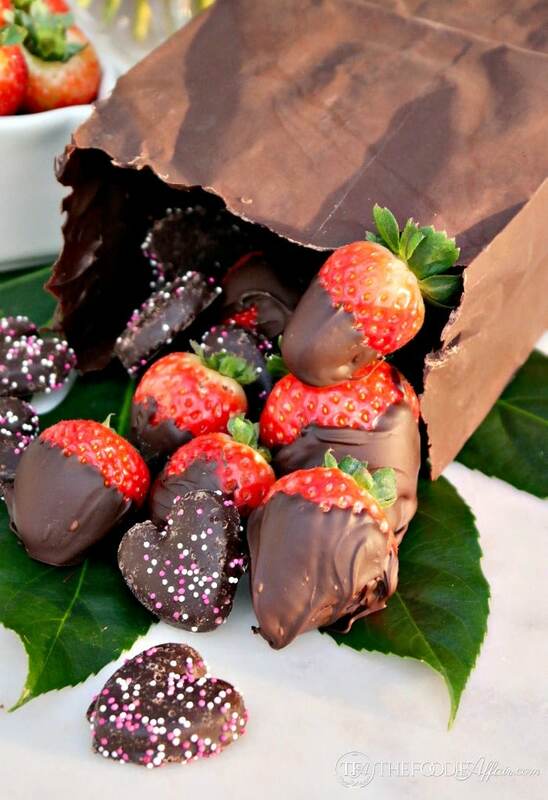 Dip strawberries in remaining chocolate and place in the refrigerator. Once the chocolate bag has set, slowly and carefully cut the bag away from the chocolate (start with scissors, then gently tear the bag). Return to refrigerator until ready to serve. 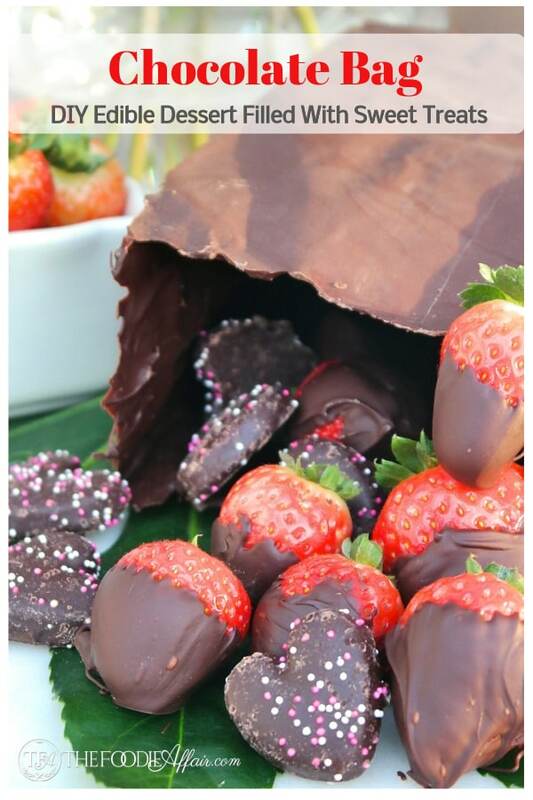 Place chocolate bag on a serving plate and garnish with strawberries, cookies, candy or fresh fruit. I love this fun idea! It’s perfect for neighbor and teacher Valentine gifts!!! Hands down, that is the coolest thing I have ever seen! I totally want to make one just to impress myself! Ha! I can’t believe that this is made from chocolate! This is such a creative and beautiful idea for Valentine’s Day. I love the whole display…such a delicious treat! This is about the most creative thing I have seen on the internet so far today! I love this! So cool! You did a terrific job. I used to have a chocolate shop and know from experience that it is hard to not crack a chocolate shell that is thin. This is such a brilliant idea and so pretty too! What a clever idea…happy feasting! I love this chocolate bag idea! John and I both love chocolate so this would be a special treat! Thank you for your family service !! We have family members in the coast guard and it’s hard on those that deploy and those who are left behind! This bag is so cute! I need to make time to try it! It’s a great presentation for Valentines Day! This is so cool! I can’t believe it’s all chocolate! My boys would love this. This bag is adorable! It’s hard to believe that Valentine’s Day is fast approaching. Dan will love this for Valentines Day!! We always try to do something that’s not the commercial route. This is beautiful AND delicious, how special!!! These edible chocolate bags were such a hit last year, I am doing them again!! I LOVE Valentine’s Day! This is the coolest thing ever!!!! I would never have thought of making my an edible brown bag. This is so very creative and not to mention, its delicious! This is better than any gift I could have bought for anyone! Chocolate is awesome but a homemade gift bag is even better!